...that the Governors of Contrition are a radical sect of the Covenant that believes the Flood to be a creation of the Forerunners to be worshipped? "The Cartographer's defenses make it almost impenetrable; the only way up to it is by a Forerunner elevator." An elevator, or a lift, is a method of transportation that allows an efficient ascent or descent over a vertical span. A Forerunner lift on Installation 00. Elevators are commonplace throughout various Forerunner installations. These elevators and their control panels have a tendency to be geometric like most things of Forerunner design. Forerunner lifts have several different methods of propulsion. How exactly they work is not always clear. Most lifts move without apparent propulsion systems at all, some have beams of energy supporting them, such as the lifts on the Ark. All Forerunner elevators encountered by John-117 on Installation 04 had no visible mechanical mechanism to move them (with the exception of the elevator in the Library). Forerunner elevators were first observed near Installation 04's Control Room. There were a few identical elevators, all of which were octagonal. The panel to control it had three components. Its left and right sides were irregular hexagons, and were also mirror images of each other. The center piece was a rectangle, and had a curving line down the middle. The Flood containment facility also had octagonal elevators. Unlike the elevators near the control center, the side lengths and angles were not all the same. The panel to control it was identical to that of the one in near the control room. During his passage through the containment facility, John-117 attempted to activate one of the elevators in order to return to the surface, only to witness the elevator crashing to the ground, disintegrating in mid-air. In the installation's Library, there were several large, circular elevators that were controlled by the installation's monitor. A submersible elevator on Installation 05. Elevators in the Threshold gas mine included one that allowed passage between the hangar bay and the station's upper level. It had an octagonal shape, with two symmetrical control panels. One was placed on the right side of the entrance, the other on the front and center wall. An identical elevator was observed shortly after Thel 'Vadamee cut the station's cables. A second, unique elevator appeared as the Covenant Special Operations team and the Arbiter entered the Flood research facility within the station. It dropped down through the facility, occasionally rotating and stopping as it took in large canisters from containers on the walls, then storing them in breakable fixtures on the surface. It was symmetrical, completely geometric and fully automated. An elevator atop a spiraling walkway led to an open area with the three cables that supported the entire station. Like most Forerunner elevators, this elevator was octagonal in shape; all the sides and angles were contiguous. Its control panel was identical to that of the one near the station's hangar. On Installation 05, a variety of elevators were observed, among them a previously unseen type of underwater elevators; capsules that are ejected downwards into the water, and then move along to their next destination. On Installation 00, two identical irregular hexagonal elevators went up and down from the base of the barrier towers to a switch room where the towers could be deactivated. Their control panels were circular with geometric details inside the circle, including a Marathon symbol. 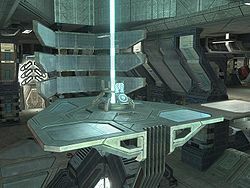 During the Battle of the Citadel, John-117 and the Arbiter took an identical, yet larger elevator up to the Citadel's main level from the structure's antechamber. A human-made freight elevator in Crow's Nest. Humans use lifts in all sorts of structures, including starships and space stations. Human lifts are mostly traditional and utilitarian in design. They are usually powered by conventional methods, such as cables or tracks. Elevator music is sometimes played in the elevators of civilian buildings, such as the Sinoviet Center. The interiors of UNSC Halcyon-class light cruisers contain several elevators, including a larger cargo lift connecting the engineering to the ship's dorsal Class-7 service corridor. 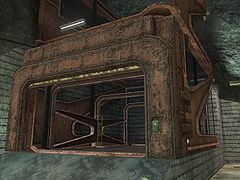 Elevators are also found on orbital MAC stations such as Cairo Station, where there was a large, two-decked cargo elevator near the station's Portside Shipping area. The UNSC base Crow's Nest had several antiquated cargo elevators that were used by the UNSC forces stationed there. In the city of New Mombasa, many structures such as the ONI Alpha Site and the underground data center had varying types of elevators. In addition to conventional elevators, humans use space elevators, massive structures stretching from a planet's surface to geosynchronous orbit, to ferry cargo into space. Constructed of carbon nanofiber, these elevators are powered by strands of superconducting material, similar to MagLev trains. Lifts used by the Covenant differ from their human-made counterparts. Instead of using traditional conventional methods, they utilize a more advanced technology, called gravity lifts. These devices create anti-gravity fields, which can be used to safely move objects vertically without any kind of moving platform. 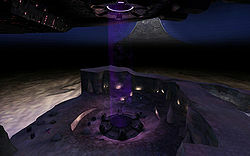 Gravity lifts are mostly used in Covenant cities and structures, such as their capital High Charity. They are also used in Covenant starships to transport and deploy troops and objects to a surface safely. Additionally, anti-gravity technology is also used in smaller pieces of equipment, such as portable gravity lifts or deployable lookout towers. Aside their ubiquitous battlefield applications, Covenant gravity lifts have been encountered several times, most notably during the boarding of the battlecruiser Truth and Reconciliation and during the Fall of Reach, when SPARTAN-B312 could use one to get to the top of Spire One. A human elevator in ONI Alpha Site. Another human-made elevator in the New Mombasa Data Center. A smaller lift near Alpha Halo's Control Room. Sgt. Johnson uses a large lift to escape the Flood Containment Facility. A large lift within the Flood containment facility on Installation 04.